This is classic Burgundian farmhouse cuisine, kindly shared by Leigh Ann, a Frenchwoman whom my best mate Brandon met during his circumnavigation of the bohemian party circuit in Prague almost 2 years ago. Leigh Ann found the recipe at this website: http://www.frenchgardening.com/cuisine.html?pid=1169488697207375, although I have, through trial and error, come up with my own little variations on the recipe (as described below). Despite the daunting look of the recipe, don't fret. It's actually very easy to cook! The hardest work is right at the beginning when you need to quarter the rabbit and carve out the saddle (which comprises the backstraps and belly meat), because you can only buy whole rabbits in Perth. It does take quite a bit of time, although you don't really need to do much for most of that time. Allow around 5 hours preparation time: 45 minutes to carve up the rabbit and prepare the vegies, 3.5 hours to make the stock, and another 50 minutes to finish off the dish. You can prepare the stock and the raw mustard-coated rabbit pieces the night before, and bake it the next day just before the meal. All ingredients (except Bugs) can be easily found in your friendly local Coles store - I paid $25.73 for it just last Thursday. Rabbits, however, are harder to come by. It's obviously best to procure a fresh. locally bred rabbit (no - don't look at the neighbours' kids' pet rabbit like that), rather than settle for a frozen one. I like the ones from Baldivis Rabbits, who supply to a number of butchers around town. I get mine down the road from Aggie's Meats, the local butcher on Preston Street in Como (it's in the same little shopping complex as the Karalee Tavern), and they get a delivery of freshly butchered bunnies every one or two weeks. You'll pay by weight, but the average cost of a bunny is $25. Optional: Get a dozen or more freshly pulled white onions 1-2 inches in diameter, peeled but left whole, cooked with water to cover, 1 Tablespoon butter and 1½ teaspoons sugar. Boil it (but not violently) until the water is evaporated and the onions start to caramelise. Prepare the rabbit: Cut off the thighs and forelegs, and the saddl. I recommend a heavier knife for the legs, and a thin, sharp filleting knife for the saddle, because farm-bred rabbits don't have much meat on their ribs. Most of the time, I just leave the meat on the ribs and fillet out the backstrap and belly in separate pieces. Cut up the saddle depending on how you want to serve them (ie bite sized pieces as finger food or halved as a table dish). If you really want to go the extra mile, you can debone the thighs and forelegs too, although this is quite tricky, and it has to be done very carefully with a sharp knife. I cheat with a pair of kitchen shears (okay okay it's just a pair of good scissors, but it does the job!) Reserve these pieces of meat, and save the kidneys as well. The Stock: The recipe calls for a heavy dutch oven, but I've found that using a big steel pot works just as well (I just didn't want to risk my precious Le Creuset pot with the next step!). Heat the oil over medium heat, and brown the remaining carcass of the rabbit (ie the ribcage, etc, including the head if you could get it). When the rabbits are browned on all sides, at the vegies (except the bouquet garni), and brown lightly, stirring, for 5-10 minutes. Add the bouquet garni and water to cover. Bring to a boil and skim for the first 10 minutes or so, depending on how much scum floats to the top. Don't worry if you can't get it all - you just want to get the more solid bits of scum out. Turn down the heat enough to bring it to a simmer (I actually prefer a vigorous simmer, or a low boil). Partially cover the pot and simmer for 3 hours. It doesn't need to be an exact science. Cut it down to 2.5 hours if you're in a hurry; leave it for 4 hours if you're feeling generous with your tiem. Go watch some TV, do the gardening, read the paper, or catch up on your chores - there's not much to do other than occassionally watch the pot to ensure that it is happily simmering away. Take the pot off the boil, and strain it into a large saucepan, pressing down firmly on the solids to squeeze out the juicy goodness..
Simmer (or low boil) the contents of the saucepan until it is reduced to by two-thirds. You'll be left with a slightly opaque, still watery mixture, with a rich fragrance. Try some of it - it's delicious! There's a natural sweetness imparted by the carrot. Don't over-reduce it, because you're going to need the moisture for the final step. Marinating the meat: 3 hours before serving, combine the two mustards with a generous pinch of salt and grindings of black pepper. Smear the remaining rabbit pieces with the mustard mixture, until each piece is completely covered on all sides, and lay them out on a gratin or baking dish. A casserole dish can work just as well, I'm sure. Set aside in a cool place for 2-3 hours. The purpose of this is to allow the mustard mix to marinade the meats. In this regard, I fnd that leaving it overnight in the fridge works just as well, or if you are in a hurry, less than 3 hours is still fine. The final step: This is the easiest part of it all, because you don't have to get your hands dirty, or wait around for hours! 50 minutes before serving, preheat the oven to 200 degrees celsius (the original recipe calls for 175 degrees), but I find that the extra heat gives the surface of the rabbit morsels a nice crispy texture. Bake the rabbit, uncovered, for 15 minutes. Open the oven, take out the dish and gently pour the wine and reduced rabbit stock over the rabbit (taking care not to wash off the mustard coating), then bake for another 20 minutes. Take the dish out again, drizzle the crème fraîche over the pieces of meat, which by now are looking absolutely compelling, and return to the oven for another 5 minutes (for this last step, I like to dial up the heat to 250 degrees celsius for that final crisp). Oh, and this is also where you toss in the rabbit kidneys, also smeared in mustard mix (you don't want to overcook them, otherwise it'll just be tough and chewy - with just the right amount of cooking, they'll be juicy and delicious, and slightly springy when bitten into). If you prepared the caramelised onions earlier, and they're now cold, this is where you also chuck them in amongst the rabbits, for a 5 minute solarium treatment. The trick to good rabbit is not to overcook it. Like all lean, game meats, it doesn't have much fat content, and overcooking with dry it out and leave you with a tough, stringy jaw-strengthening exercise. The presentation: Take it out of the oven and sprinkle with snipped chives (again, a pair of scissors does wonders). If you cooked it on a baking dish or oven tray and want to transfer the meat to a more presentable serving vessel, add the chives after the meat has been transferred. You will also find that the stock and wine mixture has mostly bubbled away, leaving a thick, syrupy coating of sweet mustard sauce on the bottom. Don't be shy about liberally smearing your rabbit bits into this fantastically unctuous and flavoursome reduction before eating it! And if you cooked your rabbit on an oven tray, just scrape it all off the tray and pour it into a small bowl or gravy boat for liberal drizzling purposes. To enjoy this as a meal in itself, serve with pappardelle noodles or simple steamed potatoes (although I like to finish off the potatoes in the oven coated with duck fat ...). Wash it all down with a glass or top quality chablis. the recipe recommends a Chassagne-Montrachet, but it's all well and good if you live in France and don't have to pay an arm and a leg for it. I think that the Pierro Chardonnay will do just fine, having been made in a drier, more chablis-like style than your usual flabby Aussie kardies. I'm also quite happy to drink a nice, earthy Aussie pinot while enjoying this dish. Something from Picardy, Moss Wood or Bass Philip is just sublime. 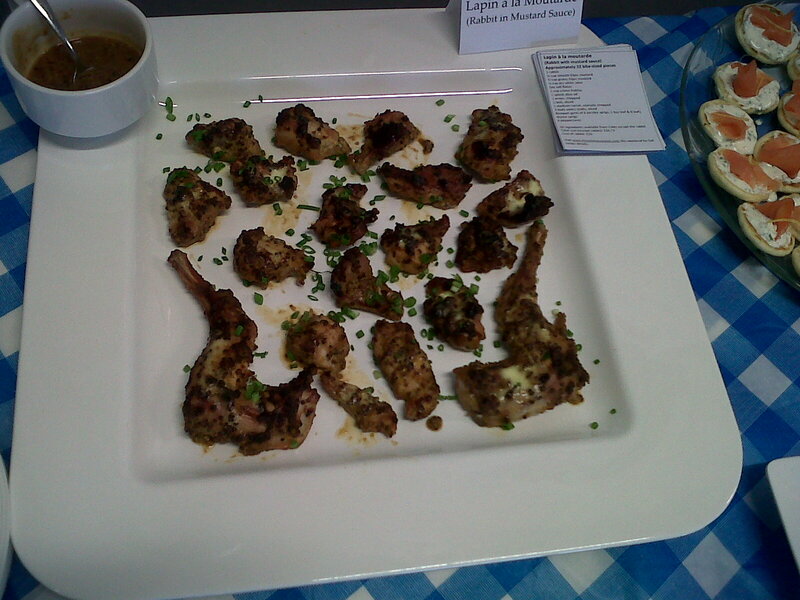 I'm also pleased to report that this dish also won the 1st prize at the office's Masterchef challenge last Friday! As they say in the old country, bon appetit! Or if you are after finger food, one rabbit provides approximately 22 bite-sized pieces (or 24 if you chop the forelegs in half). 1 rabbit (hopefully one from a good home. Just kidding! A farm-bred rabbit doesn't have the gamey flavour that wild rabbits do - choose according to taste and availability!) Include the head if possible (for the stock), but this is usually hard to get.